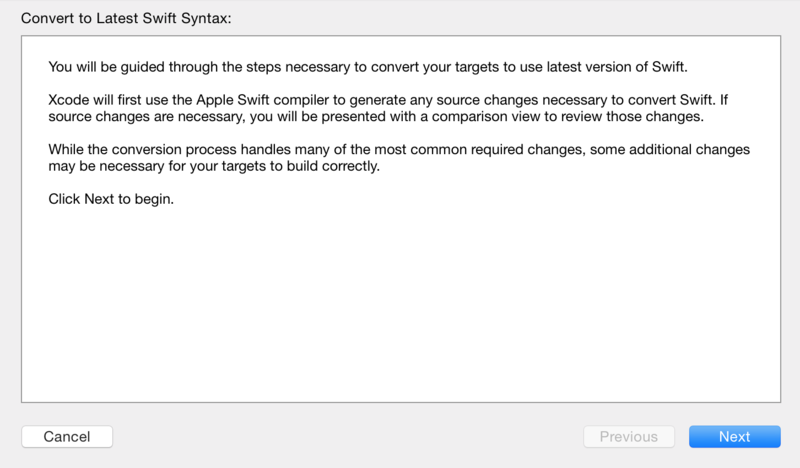 So we are all familiar with the "Convert to latest Swift syntax..." assistant Xcode provides. Yesterday, I wondered if that couldn't be leveraged to detect if a piece of Swift code is written for the version the current Xcode provides or if it is for an older version. But it quickly turned out that this was only UI. After some more poking, I ended up discovering a new commandline tool in Xcode 6.3 called swift-update. So it is an array of locations in the given files that need to be changed to update to the latest Swift syntax. From there on, it was quite trivial to build a little Ruby library around this which set up the correct flags for swift-update and provides its results in a convenient form. More information can be found in the project's README.